This time one week from now I’ll be hundreds of miles from home, sitting by the side of the pool at my parents’ house in Italy. We haven’t left the country since our honeymoon in Bali last year and I’m itching to get out of London, away from my daily commute and into the holiday swing. This year we’re spending the week with both my parents and big brother as an Italian family warm up to my 30th birthday at the end of July. There will be barbecues and sunbathing, amazing food (made by both my Mum and restaurants like this) and plenty of wine enjoyed over meals where we wonder for the umpteenth time if we might prefer a permanent life in the Tuscan hills over London. 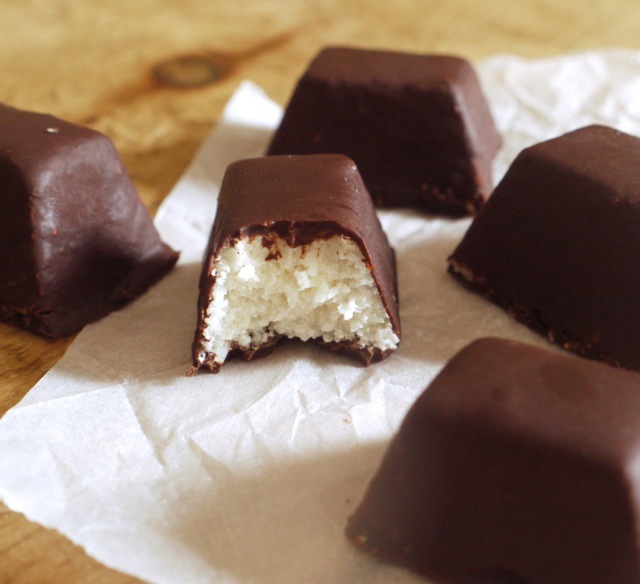 For a taste of paradise a little closer to home, this week we’ve been mostly snacking on these chocolate coconut bites. I thought about including a homemade Bounty in my cookbook, but there are other recipes I’m even more excited about and after seeing them on this blog and in this cookbook, I wasn’t sure I could bring anything new to the table. 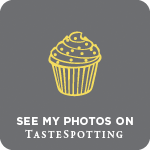 Plus it means I can share them in this space which is a VERY GOOD THING because they’re all sorts of delicious. 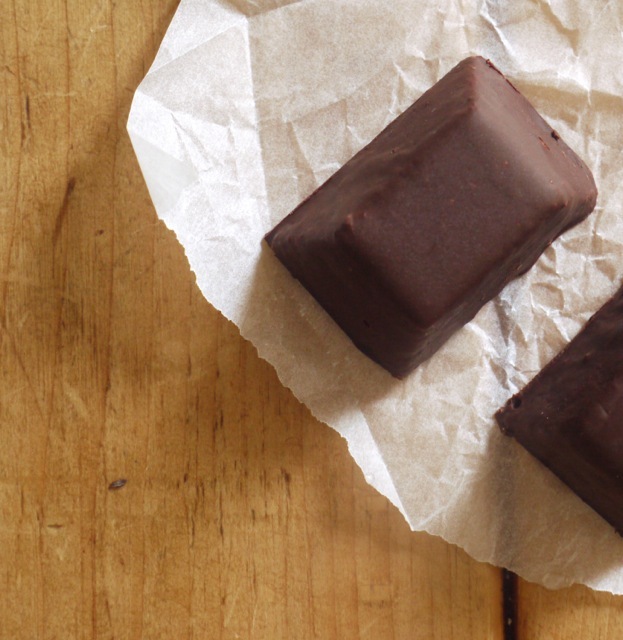 Made with just 5 ingredients, they’re lot healthier than their shop-bought equivalent, too. Coconut oil adds flavour and acts as a binder to hold the dessicated coconut together. Straight from the fridge they’re firm and refreshing; leave them at room temperature for ten minutes and you get a moister, creamier mouthful. There might be a bit of silence round here for the next few weeks. We’re on holiday, then I’m turning 30 with a party and a surprise weekend away and then it’s heads down on the photo shoot for the book in August. I’ll pop back in with some photos from that, I promise, or you’ll be able to find them on Instagram. Then business as usual come September. Have an amazing summer, I’m certainly planning to. In a blender, combine the coconut, 70ml coconut oil, maple syrup and salt. Blitz for 1 - 2 minutes to form a thick, coarse mixture. Divide between two 12-hole ice cube trays, pressing down firmly so that the mixture is tightly packed. Freeze for 30 minutes or until set. 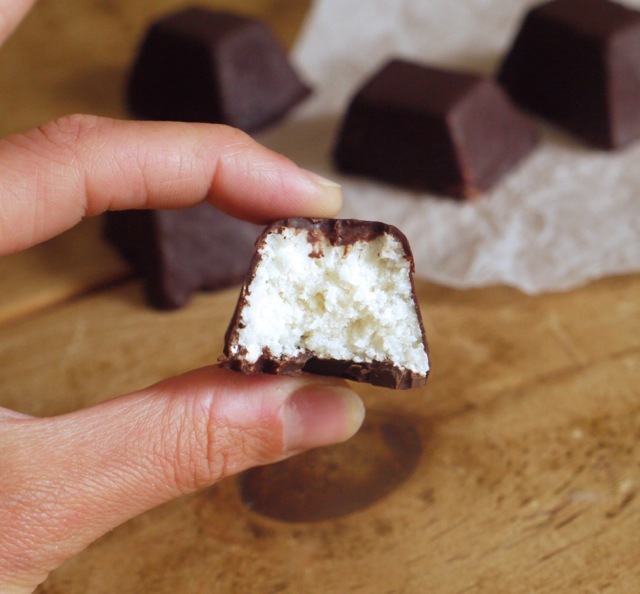 Pop the coconut bites out of the ice cube trays then place on a tray lined with baking parchment and refrigerate while you melt the chocolate. In a heatproof bowl suspended over a pan of barely simmering water, melt the chocolate and remaining 15ml coconut oil, stirring until smooth. Leave to cool for 5 minutes. 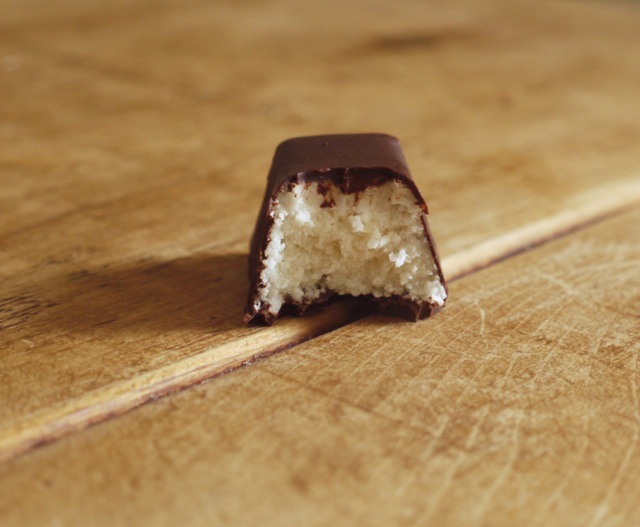 One at a time, dip your coconut bites into the melted chocolate, ensuring all sides are evenly coated. Remove to the parchment lined tray using two forks then refrigerate until firm before trimming off any excess chocolate. Will keep in an airtight container in the fridge for several weeks. « Lately . . . Happy 30th Kate!!! Have an absolutely wonderful birthday, which I’m sure you will do while you are on holiday. These little bounty bites look fabulous. I’ll definitely be trying these soon. Happy early birthday! Mine is on the 31st, but I’m not saying what age I’ll be…surprise weekend away? Is the surprise part the destination? Yes, it’s all a complete surprise…so excited!! Oh I love these! Though that size looks dangerous to me, just right for making you eat several before you realise your addiction! Yes, please! Such a classic combination. I love how easy these little bites are to make too! I’ve seen these pics on your instagram and have been desperate to get my hands on the recipe. Excited to see its only 5 ingredients – look so delicious!! Hurrah for holidays and sunshine and birthdays! Have a wonderful few weeks of celebrations. how cute are these! love the recipe. definitely one i will be recreating. thanks for sharing! LOVE these! So simple but look so tasty. Kate! I hope you’re soaking up the Tuscan sun right now! Enjoy all the celebrations and family time! Enjoy your trip to Italy (I mean, how could you not? It sounds fabulous). Lovely! I am obsessed with any recipe containing coconut oil… and this one looks so easy and delicious! I will be trying these soon! Thanks for sharing! 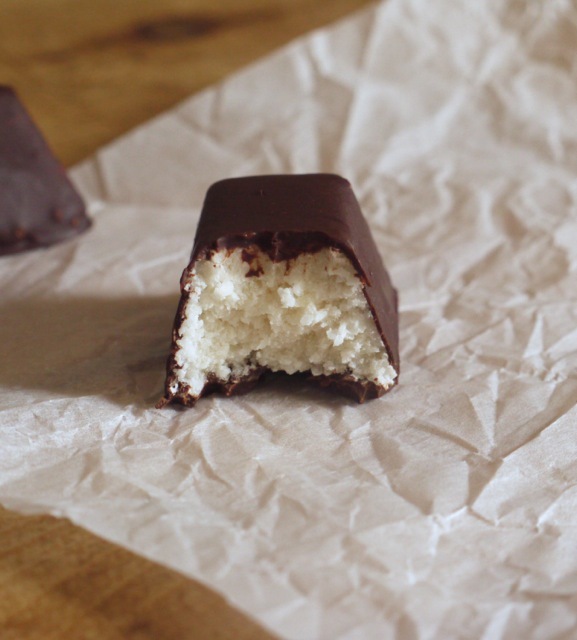 Bounty is one of my favorite and I just happen to have some coconut oil in the kitchen (that I had been wanting to buy for quite a while) so this recipe is being pinned for when it is a little less hot. Hope you have a great vacation (seeing pics on IG I know you are) and a very happy birthday!